We’d like to thank our friends, Initech Solutions inc. over @ www.gpurigbuilds.com who have shared this build with us. 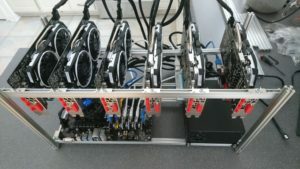 You can order Pre-Assembled and configured Rigs for crypto mining at a reasonable price. We of course suggest to make your own, but those are solid rigs. This rig hashes around 170-175mhs on Ethereum, using 800w. It can be configured to use less power but it has to be tested for stability over a few days. Parts include an EVGA 1000GQ, 6x Armor 4G RX570/580 GPUs, a high quality rig frame, which is stack-able, 8G of ram (really needs only 4), 32gb usb 3.0 flash drive and a Biostar TB250-BTC motherboard paired with a G3900/30 LGA 1151 CPU. Happy holidays everyone, and Happy New Year ! Just in time, Claymore has updated his XMR miner to V.11.0. Speed increase to be competitive with other software solutions, support for AEON coin, updated dev fee pools (read: removed Nicehash…), better stability and better security. Download it here ! Happy mining ! Updates and Mining News ! There has been a lot of new coins lately. The most profitable to mine so far are Bitcoin Gold, ETN, BTX, – or – if you don’t feel like switching all your rigs, consider going to nicehash, zpool, yiimp, miningpoolhub or another multicoin pool that switches automatically. Although be aware fees may be higher. Plus the new 1070ti is out, and performance is up to expectations. Happy mining. Faster than EWBF, check the thread on bitcointalk. Small update to say a XEVAN Nvidia miner is out, with windows binaries. Now since people rushed on the algo profitability is down, but in line with other smaller coins. Big thanks to krnlx and palgin. Short post for Claymore’s new XMR miner, which has been updated to v10.2. Although it features an improvement over his previous version (including nicehash support), it is still better on some GPU’s to use SGminer or XMR-Stak-AMD. We will be waiting for his V11 update, which should bring more speed improvements and more bug fixes. It is, however, the easiest software to use for new users. Check it out here.